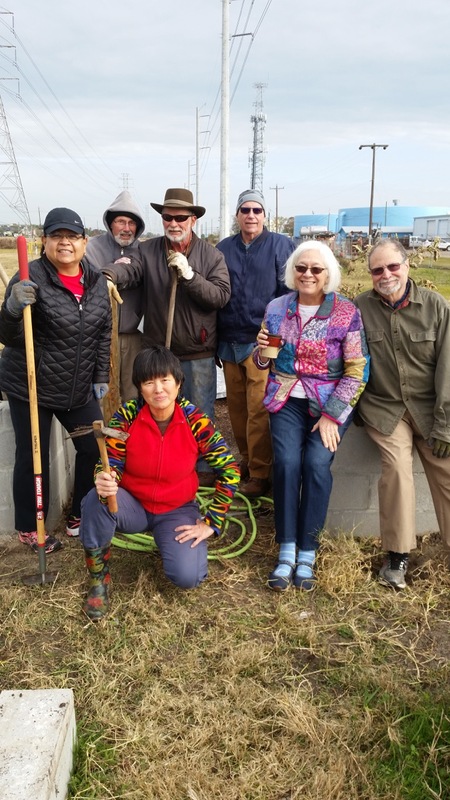 The March 16th Workday started out chilly, but an industrious group of gardeners turned out. David and Jane Malin and Robert and Susan Strahan shared tomato plants that they had started from seed. Bruce Meltzer brought muffins and Jill Veatch packed the “tucker box” with coffee, breakfast bars, bananas and mandarins. Several gardeners helped move six yards of garden soil to “top up” several donation beds. George Becker tilled an unused bed so Siok Hong Chen-Baden and Susan can experiment with different types of okra. Siok Hong and Roberta Cowan weeded, harvested, and replanted three donation beds with tomatoes. Roberta and Deandra Newcomb watered in all the newly planted beds. Many thanks to Patrick Ferrell for mowing the garden pathways and pruning our grape vines. Here are some photos from both the Feb & March work days. Our Community Garden is off to a great start! The kickoff for the spring planting season took place on Friday, January 18th in Cockrell Hall at BAUUC. The dinner and planning meeting was attended by thirteen gardeners, six of whom are church members. We’re delighted to have members from our community, especially our newest members from Nine Waves Grove. Jane and David Malin suggested several plants that they have grown with good results. Siok Hong, who prepared several vegetables from her plot, also shared growing tips. The January workday, held the next day, was attended by 8 hardy gardeners, who braved the cold and windy weather. Enjoy pictures from our Kick Off potluck and January work day! On March 17th, George Becker, Siok Hong Chen-Baden, Bruce Meltzer, Beatriz Perez-Sweeney, Jane and David Malin, and Nathan Veatch had a productive morning working in our spring gardens. Superman George Becker had previously tilled several unused rows and continued the job by tilling two abandoned large plots. One of these beds will be used as a donation bed. Several small beds are also available for adoption by new gardeners. Red and yellow cherry tomatoes, sweet peppers, zucchini and yellow squash, okra, zinnias, sunflowers and milkweed were planted. We have several beds dedicated to butterfly habitat and herbs for a farmers’ market. Three young bunnies were relocated from one of the beds to a safer area. Hopefully their mom will find them! Saturday, April. 21 is our next Garden Workday (the third Saturday of the month). Volunteers are always welcome. Come help and learn how to garden! Our gardeners hard at work! Our next Community Garden Workday is Saturday, February 17 from 8:30 to 11:00am. In addition, the annual spring Fruit Tree and Tomato Sale will be held on Saturday, February 24, from 9:00am to 1:00pm at the Pasadena Fairgrounds – 7600 Red Bluff Rd., Pasadena. Our BAUUC Community Garden is next to the parking lot across the road from the church.Volunteers are always welcome. For questions or comments, contact Nathan Veatch at nveatch@swbell.net. BAUUC Community Garden News: Looking back and looking ahead: Put AUGUST 18 on your calendars for our next garden Potluck. In 2017, our garden had a good year with a great potluck in August featuring a wide variety of dishes, an interesting speaker from Urban Harvest and door prizes. Our gardeners are not only growing some nice veggies but also butterfly attractors and Stevia. Liam (Beatriz’s son) and his friend are growing herbs for a local farmer’s market. Other faithful gardeners this past year were Vera, Siok Hong, Deandra, George B, Bruce M, Mike Wehrman, Jane and David, and Nathan and Jill. Thanks to all these gardeners for all the hard work they do in their beds and our donation beds. We will be sharing our cabbage and broccoli with the ICM Food Bank in League City again this winter. We welcome newcomers, Jeramy, Michelle and their son, to our gardening family! Saturday, Feb. 17 is our next Garden Workday. Volunteers are always welcome. Come help and learn. Check out the photos on our blog: https://bauucgarden.org or our Facebook page. 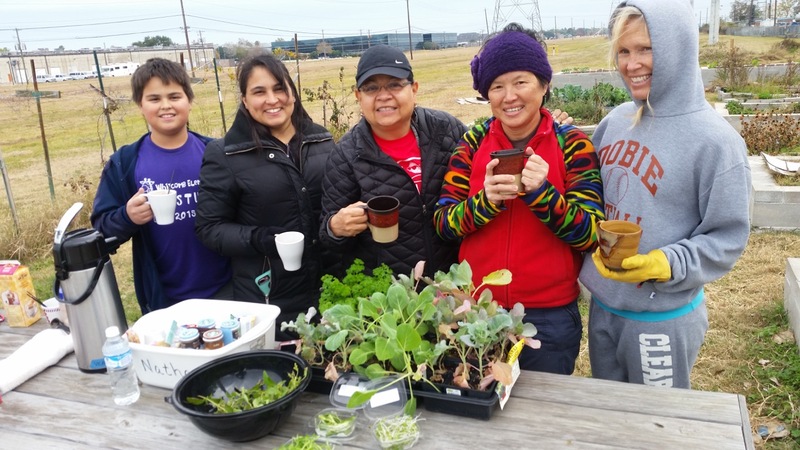 BAUUC Community Garden News:Liam and Beatriz Perez-Sweeney, Vera Tosto, Siok Hong Chen-Baden, and Deandra Newcomb enjoyed a cup of cocoa or coffee at the December 16 workday. Vera, Nathan Veatch, George Becker, Bruce Meltzer, Jane and David Malin and Siok Hong tilled and planted a raised bed. Siok Hong also shared microgreens with us. Thanks to all the gardeners for all the work they do in our donation beds. We will be sharing the produce and grapefruit with the ICM Food Bank in League City. Tomorrow (11/18/17) is our next Garden Workday from 8:30 til 11:00am. We will be cleaning out beds and planting fall gardens. We have 15 packets of seeds from Urban Harvest if you wish to plant some. Packets include spinach, carrots, pea, 2 lettuces, 2 radishes, 2 beets, onion, mustard greens, radicchio, corn salad (greens), cauliflower, and turnips.